The Hell Gang is sort of like the Scooby Mystery Team, but with hazing and dumbassery. Basically, they send out prospective initiates into reportedly haunted sites with a video camera and then try to scare the half-wits out of them. Talk about bad karma. As you might guess, they have picked the worst possible house for their latest escapade. This time could very well be the last time in Johnny Martin’s Delirium (trailer here), which opens today in Los Angeles. Eddie is the Hell Gang’s latest victim—and he really will be a victim, because these geniuses picked the notorious Brandt mansion, the scene of your basic thirteen children family massacre. After the poor sap has been gone for a suspiciously long time, the Hell Gangers reluctantly go in after him, immediate causing them to realize what jerks they were for not even giving him a flashlight. Of course, the only trace of Eddie is his camera, which is loaded with rather unsettling footage. Yet, they still act like the game is still on. Frankly, these kids need a thesaurus, because they use the word “creepy” about a thousand times while tramping through the weirdly immaculate Brandt House. Okay, so it is pretty creepy. The Brandt house and its ghoulish Late Nineteenth Century American bric-a-brac bring quite a bit of atmosphere to the table. It is certainly an evocative location (the historic Dunsmuir-Hellman Estate, also seen in the original Phantasm) and David Stragmeister’s mostly non-found footage cinematography is quite eerie. Frankly, Martin does a pretty nice job directing Hell Gang’s Hell Night, but the screenplay is just too standard issue. We have been here before and seen it done better (like the original Grave Encounters). The blandly interchangeable and thoroughly unlikable cast of characters does not help much either. Only Ryan Pinkston has anything remotely distinguishable going on as the comparatively more reflective Keith. There is just no hook here. 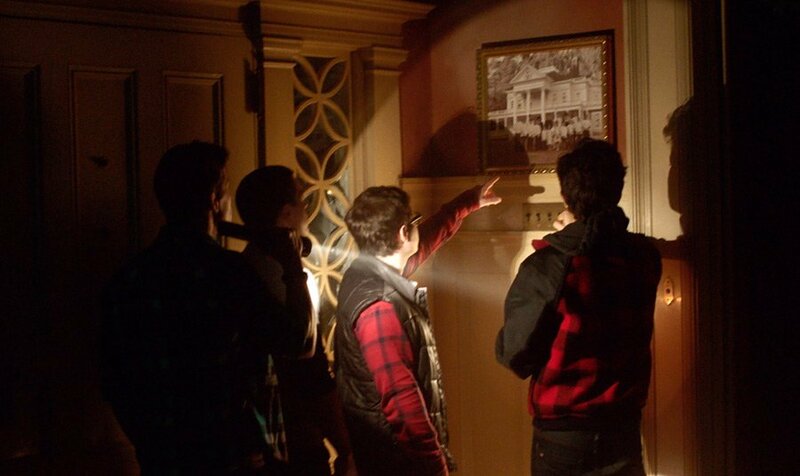 A pack of obnoxious kids enters a haunted house and have their heads handed to them by an evil entity. Ho-hum. Still, Martin shows some consistent skill. Delirium could be considered a step up from Hangman, if anyone notices it. 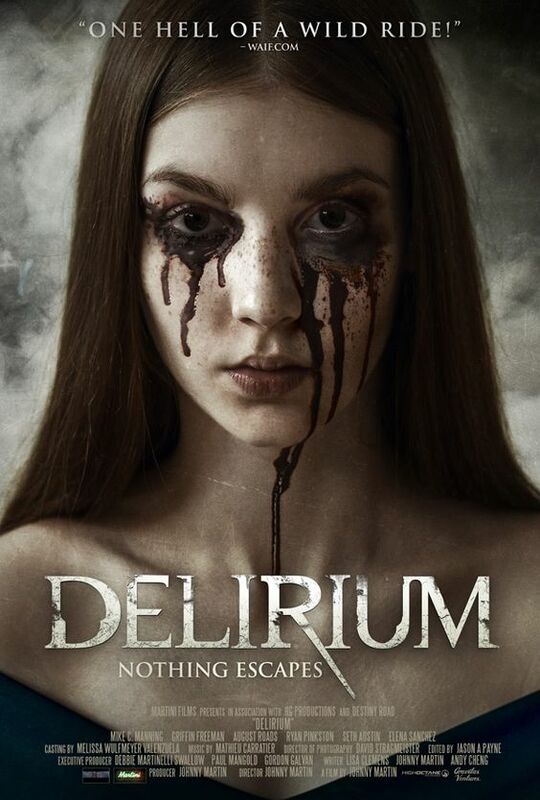 Only recommended for horror fans desperate for a fix, Delirium opens today (1/26) in Los Angeles, at the Arena CineLounge.